The label position on the peel-off tongue is adjusted with the adjustable rewind assist roller. Labeling is possible from all sides. 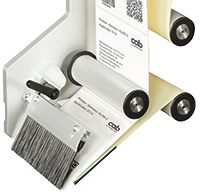 During labeling, the next label is printed simultaneously. The conveyor belt speed has to be adapted to the print speed.